Pursuing a More Sustainable Future Guided by her passion for sustainability, Sofia Mongeon, a senior BSBA student at Kogod, hopes to bring environmental change to the business world. Sofia Mongeon. Credit: Will Diamond. When Sofia Mongeon, a senior BSBA student at Kogod, graduates, she plans to bring viable, sustainable practices to businesses of all sizes. A long-time animal lover and self-proclaimed sustainability “nerd,” Mongeon has spent years cultivating her passion for the environment. And while she originally didn’t plan to dedicate her education and career to it, after taking an environmental elective her senior year of high school, Mongeon was hooked. When she arrived at Kogod, Mongeon realized that business and environmental classes weren’t intertwined. After participating in a University College that focused on sustainability her freshman year, Mongeon decided to combine her two passions into one. She took the initiative to pursue a double major that would encompass both business and sustainability. Looking back, the reward was worth the hard work. For over a year, Mongeon has worked at the World Wildlife Fund as a Corporate Renewables intern. The internship, she explains, is the perfect combination of her coursework at Kogod. On the job, Mongeon works with large businesses to help them reach their sustainability goals. The importance of the work doesn’t escape Mongeon, especially with the release of the Intergovernmental Panel on Climate Change’s (IPCC) 2018 report, which warns of dire climate change consequences in as little as 12 years without immediate action. In her spare time, Mongeon is doing everything she can to contribute to the sustainability movement. In addition to her classes and internship, Mongeon is a student sustainability educator in the Office of Sustainability. 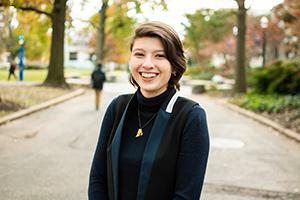 Her role requires her to reach out to students and help them make changes in their behavior so that sustainable choices are easier to make, with the overall goal of making American University a more sustainable campus. During her summers, Mongeon volunteers for Save the Bay, a nonprofit in her hometown of Rhode Island that works to clean up Narragansett Bay. “This is important to me, this is part of my childhood and I have fond memories,” she said. “I don’t want [the Bay] to go away because I want future generations to be able to [go there] and also have fond memories of it." Looking ahead, Mongeon has big plans for the future. Upon graduation, she hopes to work with businesses to bring renewable energy practices into the fold. She wants to see businesses set comprehensive, sustainable goals; be more transparent with their business transactions; and create goals that are based on science.